After the success of my little Union Jack purse/accessory cover last week, this week I have been mostly making some more. I started off with the remainder of the scraps of blue fabric to make three more identical versions. Blue fabric all gone, I turned to the rest of the hessian-type remnant and got busy with other scraps of fabrics and some more ribbons from my stash. The Cath Kidston Stars ribbon is a recent purchase. I finally got to visit the new store in Bournemouth, which unbelievably took me about three weeks to get round to! And finally, at Mum's suggestion (thank you Mum!) a way of using up some more Cath Kidston scraps and keeping our friends from across the pond happy. I really love how these two turned out but am resisting temptation to claim one of them. I need some stock to sell! In crochet news, lots of happy outdoor time at the park in the thankfully arrived sunshine has provided plenty of hooking opportunity, and my baby ripple blanket is almost complete. Having never got to this stage of crochet before, I asked my crochet guru Bex at SnB last night if I was edging it the right way. Apparently I am, so Yay! I firstly went along the edge in double crochet, and am now making my way back along with trebles. In some versions I have seen, people 'fill in' the ripples along the top and bottom, but it is the shape of the ripples that I love about this blanket so I want to keep them. At the beginning, I shaped the corner by using a double crochet, then a half treble, before going on to the main trebling. I'm quite pleased with how it's looking so far. A little gratuitous close-up shot to make your eyes go funny! As well as being a crochet and knitting guru, Bex is also a spinner and dyer of yarns. She has a shop online which you can visit here. I had been admiring many of the Hitchhiker shawls knitted by members of SnB and decided to have a go at one myself. I ordered the pattern and a needle and Bex very kindly brought me a lovely selection of yarns (see, I'm slowly coming around) to look through last night. I settled on a lovely wool/nylon 4ply sock yarn dyed in gorgeous deep purple and turquoise tones and last night after SnB set about turning a skein into a ball. This was my progress as of 12.37 a.m.
Not really sure what I did wrong, but another hour or so this afternoon has left me with this. I'm off dancing tonight so can't make a start just yet and it feels a bit ridiculous to start knitting a shawl when it's so blinking hot, but no doubt this will be another WIP by the end of the weekend! Wishing you a lovely hot weekend with sun loungers and pina coladas. I love the purses and I love the blanket - such great colours! I have only ever crocheted squares, so am thinking of trying something a bit more adventurous for my next project. Thank you! 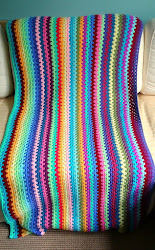 The blanket is mostly made of Rowan Handknit cotton, it comes in loads of great colours. I would highly recommend this pattern for a beginner (like me) as you only need to know how to chain and do doubles and trebles. Wow, you have been busy! The purses look great! Ah wow the purses are so cute!